RUPA receives a total of $815,000 for the fiscal year starting on July 1 and ending June 30 annually. Of this total, $592,000 is allocated from the department of Major Events and Programs and Student Affairs generated revenue, garnered from payments for room reservations, equipment rentals and royalties from food vendors within the student centers. The remaining $223,000 is directly allocated from the Rutgers University Student Assembly (RUSA) Allocations Board. This sum is aggregated from $3.75 of the total $10 student fee, which is charged to all full-time undergraduate students attending the Rutgers University New Brunswick/Piscataway campus each semester. For a better understanding of the events, programs, and services provided by each of the committees, please visit our committee page! While following this framework for the fiscal year, the RUPA Executive Board also takes into consideration the individual committees’ needs and plans that may not have been anticipated earlier in the year. If a committee expresses the need, consensus is reached amongst the Board to reallocate money that was previously designated to another committee. This ad-hoc reallocation happens on an as-needed basis and previously happened for events such as Hot Dog Day and Beats on the Banks. RUPA goes through a thorough program proposal process to ensure that a variety of programs are provided throughout the entire academic year, on all five campuses. This process generally begins two to six months in advance of the desired event date. All Council members have the opportunity to share their opinion on the proposed event, regardless of committee. To prepare for this internal vetting of programs, committees brainstorm beforehand and draft a proposal to be presented to Council. This initial proposal contains suggested artists or vendors, venue location, date, and anticipated cost of the event. After this initial vetting process, the committee either revises their primary idea for the event or moves forward with planning. 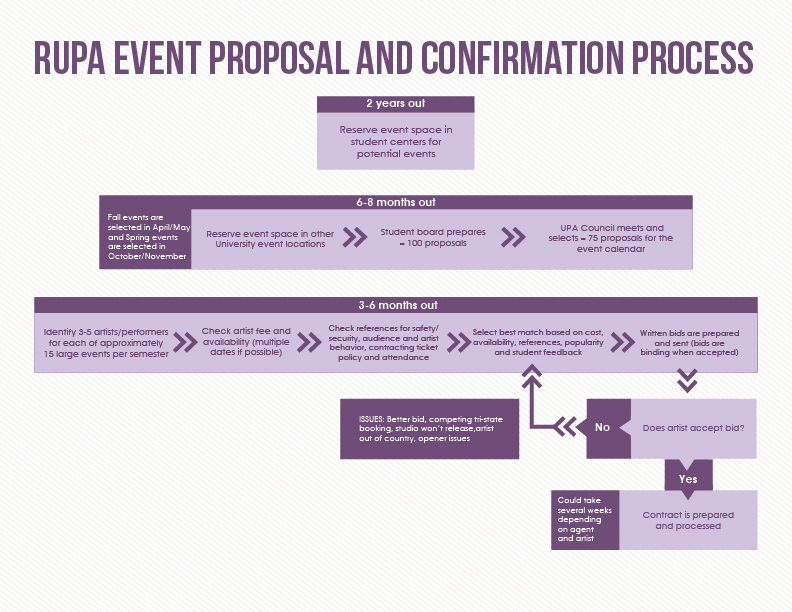 To ensure an objective view of our larger contracted events, the proposed event goes through an external vetting process as well. This occurs when RUPA members contact venues where artists or vendors have performed to gather insight on how successful the program was and the ease of day-of-show management. RUPA directors and advisors review these references before moving forward with contracting. For example, RUPA adhered to this process for the April 2014 Beats on the Banks concert featuring DJ SNAKE. The Concerts and Coffeehouses Committee brainstormed a genre for the show, serving to narrow down the possible artist selection. Genres are decided based on the desires of Rutgers University students, as well as previous genres that were already catered to throughout the year. After selecting EDM as the preferred genre, the Concerts & Coffeehouses Committee recognized that this overarching genre was catered to the previous year, and decided to move forward with a sub-genre of EDM, known as trap. To propose artists to council the Committee took into consideration its budgetary constraints, mission to create an event desirable to a large university student audience, and an organizational commitment to having on-the-rise artists perform at Rutgers. The Concerts & Coffeehouses Committee had a pool of three candidates, proposing all to council and receiving valuable feedback. After completing several references, DJ SNAKE was recommended by previous venues, fit within our budget for the event, and was available for the specific date we were able to use the RAC so RUPA moved forward with contracting and planning for the Beats on the Banks show. While this program proposal and selection process has many factors and often begins far in advance, RUPA is always looking for ideas and feedback from our student peers. If you have an idea or any feedback you want to share with us, please email rupainformation@gmail.com.